Thank you all for the kind words about my little one. Time has passed and we've been hoping she is ok. She will be but is still struggling a bit. The tests all came back normal and it was determined that her symptoms and pain are just a virus. "Just"- isn't that a horrible word sometimes? Just a virus. She's in extreme pain - it's just a virus. There is nothing we can do - it's just a virus. I just HOPE that it will go away quickly and the little Jet will be back to normal soon. As time has been passing I've been working on a few new pieces and re-stocking my Etsy shop. I know that I share a lot of tutorials and such. I know that a lot of really creative and capable people read my blog and even re-create my ideas. That is why I share. I like to share. However, I also know there are some who read my blog and like my creations but don't have the desire or time to make them for themselves. For this reason, I'm officially offering some of my designs for purchase. And, it's not just my jewelry. You can even do custom orders of my word art too. Don't worry though, I will continue to share tutorials and encourage crafting. Here's a few new necklaces that I've been working on and were the first to be posted in my shop. To make them I used stamps that I fell in love with and purchased when I was doing a blog give away for Elizabeth Mindemann/Close to My Heart. This is from the a background set called Diverse Backgrounds. Doesn't the pattern look like a rich brocade fabric? I'm in love with it and I love how once painted and glazed, it almost looks antique. If you'd like to know, to make this I followed the same steps as I do on the word pendants. You just use the stamp to cover the whole area of the clay instead of just part of it. For this one I used the set called A Garden. Again, another favorite. I love the little tree and what do you think of the rectangle shape? This green color is one of my favorites too. Anyway, I'm off. I hope you are all enjoying the first couple of days of March. Green things are coming stay tuned! Hope she feels better soon. 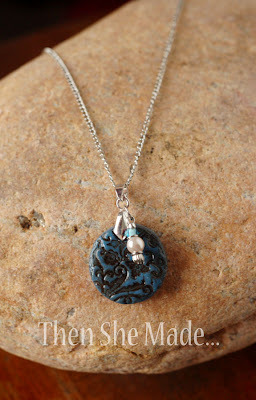 Sweet pendant~ Happy March. Oh my word Amy! 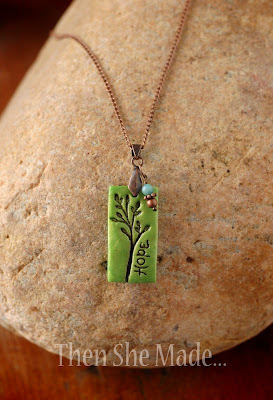 LOVE LOVE LOVE that hope necklace!And my fave color to boot! Do you sell that one? If so how much?? I absolutely LOVE your Hope necklace!! I'd love to buy one, too!! Love the hope necklace! Love the chosen color. These are gorgeous! I just love what you did with stamps! I'm going to share this on my facebook page and my blog! Too Cool!! Amy...I am so extremely pleased with my necklace! I LOVE LOVE LOVE it! I get so many compliments when I wear it! You do such an awesome job! Thank you again!